In this world of technology, every other person has a smartphone. These phones without doubt, possess apps such as Facebook, Twitter and WhatsApp. All with an agenda of ‘keeping you connected". If you go to a mall, a restaurant, or even go shopping anywhere, you will find everyone busy browsing and chatting on their phones instead of actually doing what they’re supposed to do. The need for being connected is so extensive that letting go of these smartphones is just not an option. Not even while walking. You may say, "Oh! What’s the harm in texting while walking?," Well, nothing much really, Probably just bumping into walls, falling down stairs, tripping, stepping into traffic, you know, nothing major. Buzzfeed recently reported about a woman who walked off a pier and fell straight into the ocean because she was just too busy checking her Facebook feed. As funny as this may seem, specifically with regards to "public safety", accidents that can occur while texting and walking is actually a serious issue. So, what’s the solution to this problem? We can’t take away everyone's phones now, can we? China has the solution to this! They have introduced the world’s first ever mobile phone sidewalks. 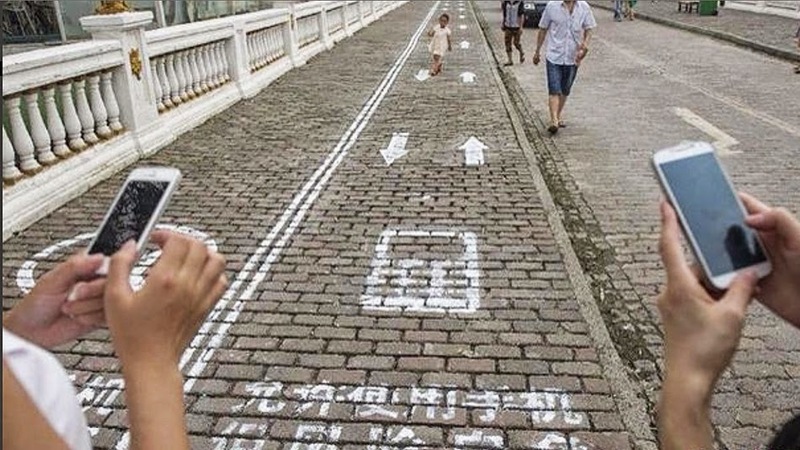 In the city of Chongqing, China, authorities have designated a 30 meter (100ft) “cell phonelane” for people who use their phones while walking. The ‘phone lane’ is divided into two: One side is for the phone users and the other regular walkers (who aren't obsessed with their phones). 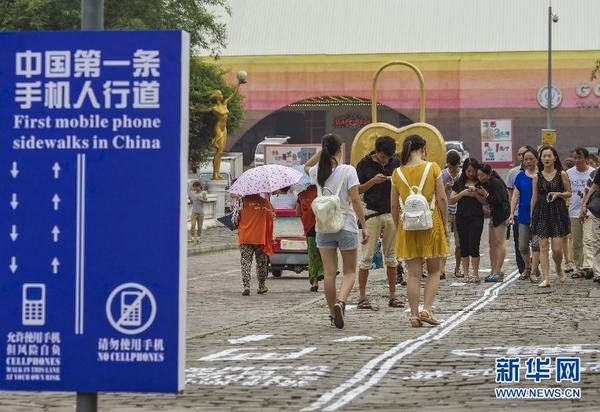 There are also large signboards around which have information on how to use the “First ever mobile phone lane.” Painted warnings on the street itself are also present, warning pedestrians to walk in the proper lane. This may seem as a bizarre concept, many of us will say people should just be more careful about their surroundings and you’re probably right, but with all of us roaming around like zombies, with our eyes glued to our phone screens, it’s actually useful. Embarrassing and life threatening situations like how the woman who fell into the ocean faced, will not happen. Imagine having one of these in Dubai. Just like we have a separate lane for buses to travel in, we will have a lane for people to walk with! This way maybe we will reduce accidentally crashing into people while at the mall or the street. This is actually a reminder to all of us that we shouldn’t be on our phones so much and spend time in the real world rather than bury ourselves in a virtual reality which gives us a sense of being connected. The writer is an undergraduate student from School of Media and Communication specializing in Journalism.